Yay!! It's time for the nail files! OPI had a competition called Your Nails Rock that I think is over now because I tried to find a link to share but it seems to have disappeared, which is a bummer for you (because it was open to everyone) but also for me because I guess that means I didn't win. Haha! Anyway, I wanted to share the mani because I thought it was super cute (not that I'm biased)! I used two coats of e.l.f. Desert Haze on my pinkie, pointer finger and thumb and two coats of China Glaze Too Yacht To Handle on my ring and middle finger. Then, I cut up a bunch of striping tape and made the off-center crosses. After pressing down firmly on the tape, I did two VERY QUICK coats of OPI You Don't Know Jacques and then peeled off the tape as fast as humanly possible. To finish, I used Finger Paints Paper Mache and a dotting tool to make the little hearts. Some nail gurus may say this technique is cheating but who the heck cares? I've got other things to do aside from sit around and paint my nails all day so if there's a way I can do an awesome mani and still have time to cook dinner, everyone wins, right? Errr…in case I'm not being clear here, the answer is YES! Haha! I hope that my little confession helps you in future nail art adventures! Have an amazing weekend, fellow nail enthusiasts! YAY FOR WEEKENDS! And don't forget to link up and show off what you're rocking this week! I love the clean lines and the little hearts! your nails awesome. I nails are pink right now. I will be hopping back in to the nail files here soon. Damn girl, those lines are perfect! I love the "wrapped present" look and YOUR HEARTS ARE ADORBSSSS. Meanwhile, it took me a whole week to remove my chipped polish, because I still can't find my remover. Seriously. This is the cutest thing EVER! 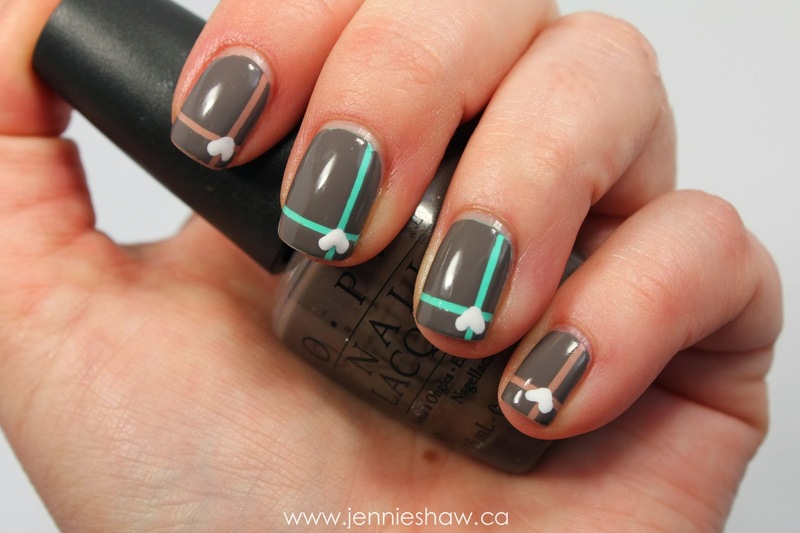 I am SO in love with this mani (I might have to copy it!! Credit given, of course)! With the goopy polish: a tip: nail polish thinner. NOT nail polish remover but thinner. It runs about $2-5$ a bottle and SO WORTH EVERY PENNY! It's saved a few of my hard to work with polishes lately.